During each school term I organise and run virtual field trips for classes throughout New Zealand. We go on trips to study New Zealand's biodiversity and natural environment. Each field trip has background pages so that everyone knows a little about where we're going and what we are going to see. I help teachers get ready with curriculum and classroom ideas. I began my career in education as a primary school teacher. The last job I held in this area was a teaching Deputy Principal with Year 7/8. I became a LEARNZ field trip teacher in 2009. I enjoy catching up with people from places I have visited before. 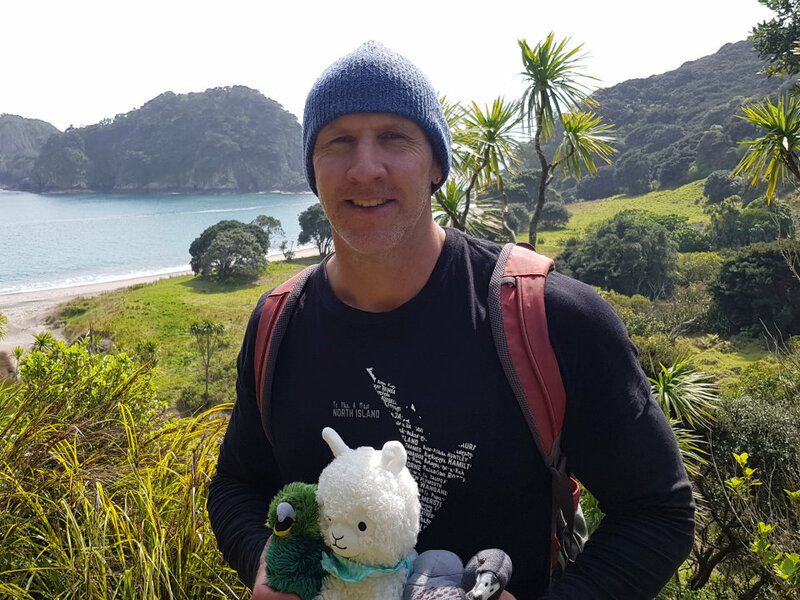 I also love exploring parts of Aotearoa that I have not been to yet, and sharing my discoveries with all of you! Long periods of time between field trips as that usually means long periods of time in my home office. On the Wandering Whales field trip to Arapawa Island in 2010, we only had two opportunities over four days to get up close to humpback whales. During these occasions, space was limited on the back of the DOC research boat because the team needed very little interference with their work. The videographer and I had to make a quick decision about filming these amazing mammals, as there was little to no time for preparation. We quickly decided that I would film and narrate at the same time, with the videographer taking photos from within the cabin of the boat. I had never done this before but I knew I had only one opportunity to make it work! It was extremely exciting being up close to the humpback whales but I was able to contain my excitement enough to get the job done. You can check out the results here if you like - A Whale of a Tail | Up Close in Tory Channel. This story is humorous only because I didn't get hurt! I was videographer for LEARNZ teacher Shelley on the Project Crimson field trip back in 2009. The topic was all about pōhutukawa, and for one particular video I decided to climb up a pōhutukawa tree to get a different angle for filming. I got the shot but as I went to climb down the tree I fell! I was quite a long way up but luckily my fall was broken and the landing on my bottom was not as hard as it could have been. My pants got rather muddy and ripped but luckily I was okay. I have a Bachelor of Sport and Recreation, Diploma of Teaching and a Graduate Diploma of Education Management. Fishing and the outdoors, cooking, gym, landscaping, family and friends. Andrew will be taking you on the Adapting After Emergencies field trip. Image: LEARNZ.